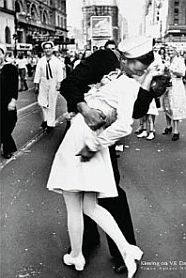 The woman most generally accepted to be the nurse kissed by a sailor after the surrender of Japan in WWII in the famous Alfred Eisenstaedt photo V-J day in Times Square has passed away. Edith Shain was 91. The 1945 photo taken in New York City became one of the most recognized symbols of the end of the war. Eisenstaedt held the copyright until his death in 1995, at which time it passed on to the Getty Museum and its Life magazine archives. While Shain was generally recognized as the female subject in the photo, the identity of the sailor kissing her has been much more of an open question. Eleven people have stepped forth claiming the role, and a variety of forensic scientists have compared the photo to the candidates. George Mendonça of Newport, R.I., seems to have the most solid, objective evidence in his favor. Shain did not come forward to identify herself until the late 1970s. In 2005, she recreated the scene with another of the sailor candidates, Carl Muscarello, to commemorate the 60th anniversary of the photo and the end of the war. Would you like a copy of this famous photo? Posters of it are available on Amazon.com for $18.99.